Our son Øystein and daughter in law Silje are looking after a little dog for a few days. Today we all went out skiing. The winter we are having this year here in the middle of Norway for many, many years, with great conditions for cross country skiing week after week. I have nor skied much the last years, but now my joy of cross country skiing is coming back with full force. When Øystein and Silje called yesterday, asking if wanted to go skiing this morning, it was easy to say yes. This year of turning 60, I have decided to do things I´ve never done before. Like cross country skiing out in the darkness, with a headlight. This is something Terje often does, but for me it was a new experience. Yes, I have been out skiing at night before, but then in tracks which had light. It was magic, pure magic. One thing is for sure. I will do it again! It is the week of Christmas, or romjula as we say in Norway. We still have a full house, and every morning we are up early with Leander. Blessed moments. These morning hours are still pitch dark outside, but as light return, and Leander´s parents woke up, Terje and I took our skis and went out into the forest for cross country skiing. When winter is like this, there is nothing more beautiful on earth. And lucky us, it is all just outside our back door. A couple of hours like this, and we are ready to get beck home, starting the next meal. today we will serve halibut for four generations. As soon as Terje hears the world snow, he is making plans for his next cross country skiing. And as soon as the first snow flakes starts to fall, he is out on his skis. I need more time. A lot more time. But I do love skiing and I do love nature, so this morning, just after breakfast, I was out with my cross country ski hero. My every day life hero. It is a year since I had skis on my feet so I felt stiff in the beginning. But it didn´t take me long to find my old young self. After all I am Norwegian, I was born with skis on my feet. Cross country skiing for me means finding a cosy place somewhere out in the forest where we can sit down with hot chocolate, pastries and sharing an orange. Last winter we had almost no snow and I did no cross country skiing at all. Not until New Year´s Eve, which was last year, but not last winter :-) I did miss it, and I did ask myself some times - will I go skiing again, or is cross country skiing for me an era in the past? But of course it is not. 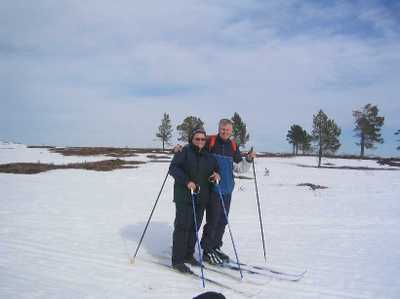 Like all Norwegians I was born with skis on my feet, and cross country skiing is a past time I love. 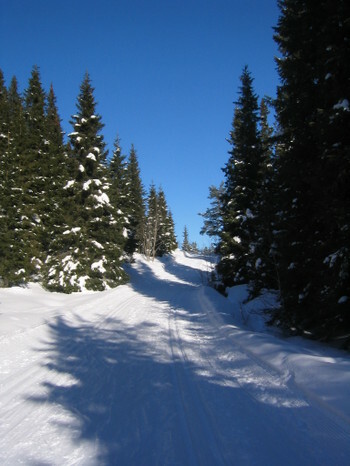 We do have snow this winter, and when we drove to the cabin on Friday we stopped on the mountain pass, halfway to the cabin, put on our skis and had a whole mountain all by ourselves for a couple of hours. By the way, my mother is my role model. She cross country skied till she was 83. I still have more than 25 years to go. I have been away for my studies this week. Took the early plane down to Oslo on Monday morning and came home with the train last night. The train ride is almost 7 hours, perfect for reading. Today we woke to the most glorious winter morning. Marta had two friends staying over for a pyjamas party. After breakfast one of them had to go home, but the other one went with ou out for a day with cross country skiing. We packed our backpack with food, hot cocoa and logs for a fire. 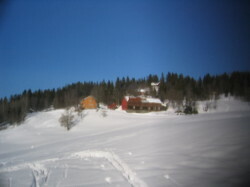 The first stop was a cabin, Rønningen, where we stopped for coffee and fresh pastry. Sat out for some time in the snow there. But we wanted to ski more, and after a while we stopped for the fire and the griiling of sausages. Life has been perfect today. And the weather forecast is promising us more good weather tomorrow - which means more skiing, more black burnt sausages, more oranges and more sun.